This decision can impact the success of the service as a poor choice can result in inferior performance or higher cost in the short-term, and in the long-term it can hinder scalability or necessitate an expensive swap if the technology is not sufficiently future proof. To guide companies towards the optimal choice, we offer a comprehensive white paper to help select the most suitable technology for each use case and industry. Ecosystem requirements – future proofness, global reach and interoperability. No single technology or solution is ideally suited to serve all potential IoT use cases and certain technologies will coexist alongside, as complementing rather than competing standards. Currently, there are also various actors within these technologies that are aiming to establish their market dominance and ecosystem. The current fragmentation is not sustainable for the industry in the long run and leaders will emerge. According to our analysis, for IoT deployments in remote/wide areas, LoRa, NB-IoT and LTE-M are good complements and together will address a large share of this market. LoRa’s dynamic open ecosystem is ideal for private networks with customized deployment, while NB-IoT and LTE-M are backed by major mobile operators offering standardized connectivity with global reach. Other proprietary technologies, like Sigfox, may address certain niche segments but their future proofness is to be time tested. For applications requiring high data rate, the most suitable technology options are either LTE, Wi-Fi or BLE, depending on the scope of the IoT deployments. 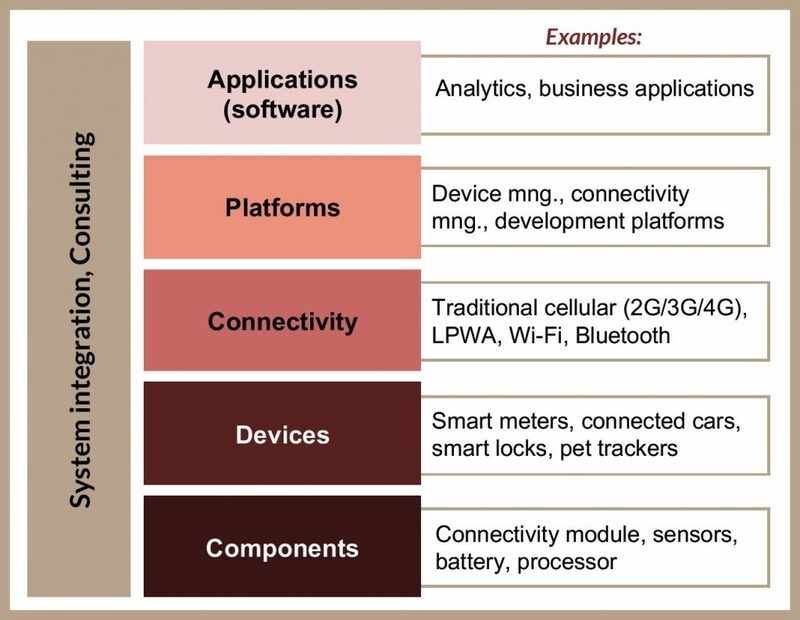 For local short range applications, the choice of connectivity technology is less obvious and often the interfaces and implementation of platform and application layers become more crucial. From around 2020 onwards, 5G networks will also start to be commercially available, bringing improved capabilities to address both massive and critical communication use cases. Finally, this report provides some case studies and discusses the needs of various application areas, such as automotive, smart cities, industrial manufacturing, in order to illustrate which technologies can be best suited to serve those needs. The Internet of Things (IoT) is transforming many industries and will create value for both businesses and their customers. This report aims to provide a structured approach enterprises can use to analyze their requirements for connectivity technology, deliver insights about the connectivity technologies available and how they can serve the needs of specific application areas and use cases. Selecting the most suitable connectivity technology is one of the critical decisions that a company needs to make in its Internet of Things launch strategy. Selecting the most suitable connectivity technology is one of the strategic decisions with long-term implications that enterprises need to make when deploying IoT. The IoT journey typically starts with defining the vision and objectives – these can be to increase revenues by enabling new services and business models or decrease costs in internal production processes and supply chain. The main question to ask is how the connected product and the data generated are going to be used and deliver value to the enterprise and its customers. After defining both the strategic and financial objectives and impact, enterprises can proceed to identifying technology requirements and selecting the most suitable technologies and vendors. As illustrated in Figure 1, deploying IoT entails securing an end-to-end technology solution that includes hardware (device, components), connectivity technology, platform and applications (software), often brought together with the help of a system integrator/technology consultancy. Each of these components is important and carries its own requirements. In this paper we focus on providing insights and analysis regarding how enterprises can select the most suitable connectivity technology among several alternatives such as traditional cellular (2G/3G/4G and in the future 5G), a range of Low Power Wide Area (LPWA) options, Wi-Fi and more. (Part of) sophisticated machines that need to report data and be monitored, upgraded and maintained remotely, with the need for high level of security and to be future-proof for 5-10 years, while potentially operating in places hard to access. For some use cases the choice of technology can be very straightforward, while for others the enterprise may need to choose among a number of technologies that can in theory satisfy the needs, but likely with different trade-offs. Selecting the right connectivity technology (and vendor) can impact the outcome both in the short and long-term and therefore both perspectives should be considered. In the short-term, a poor choice can result in inferior performance or higher cost than budgeted; in the long run it can hinder scalability as device number increases or necessitate an expensive swap if the technology does not prove sufficiently futureproof to support the long lifecycles of some products. There are currently a range of technologies available for IoT based on both licensed and unlicensed spectrum, and respectively actors that are aiming to build their market dominance and a strong ecosystem. The current fragmentation is not viable for the industry in the long-run. We believe that certain connectivity technologies (or players) will emerge as leaders in their category, however, no single technology or solution is ideally suited to serve all potential IoT use cases. A number of technologies (and vendors) will coexist alongside, as complementing rather than competing standards. The choice of connectivity technology for an enterprise depends on the specific use case requirements and competitive environment. In any case, a phased approach is recommended, where companies start small and scale gradually. Traditionally, the IoT landscape or rather the machine-to-machine (M2M) communication has been dominated by radio technologies such as ZigBee, Bluetooth and Wi-Fi for short range local area networks, and traditional cellular such as GSM (2G), UMTS (3G), and LTE (4G) for wide area networks. In the near future 5G will be also added to the latter. Many of these technologies, especially Wi-Fi and 2G/3G/4G were originally designed for consumer and business voice and data services. A number of new radio technologies have emerged recently to connect things that were too expensive or too remote to be connected previously. These newcomers characterized by their low power consumption and wide coverage are generally known as Low Power Wide Area (LPWA) technologies. We divide them into two main categories. The first one is proprietary LPWA such as Sigfox, LoRa, Ingenu, which operate on unlicensed spectrum; they are typically deployed by non-telecom actors but can be also deployed by telecom operators. The second one is 3GPP standardized LPWA (for simplicity often referred to as “cellular LPWA”) such as NB-IoT and LTE-M, which are operator managed networks and operate on licensed spectrum. These technologies were specifically developed to provide a cellular option that addresses the needs of IoT; they were standardized in 2016 and deployments started in 2017. To choose the right option for a specific IoT application when facing such a diverse selection of technologies, requires understanding of technology from many different aspects. As illustrated in Figure 2, our framework divides the criteria into three main dimensions: technical, commercial and ecosystem related requirements. In the following section we will describe the relevance of these requirements. 3GPP is the industry group specifying wireless networking standards. 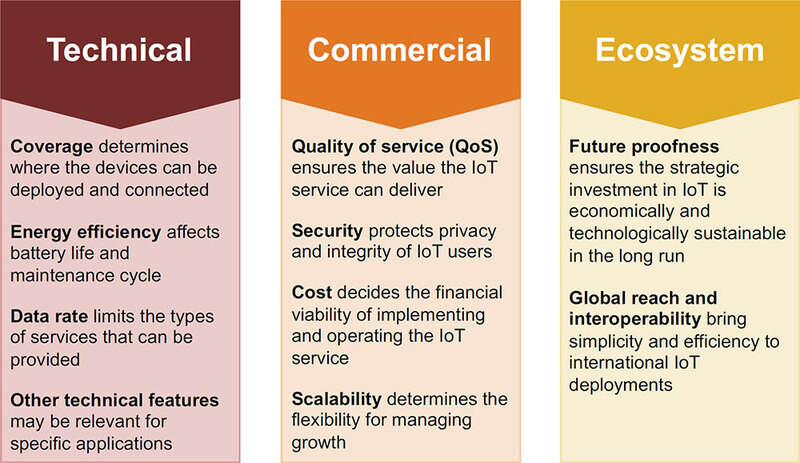 The three main technical requirements for any enterprise looking into IoT connectivity technology are coverage, energy efficiency and data rate. No single technology can excel in all these aspects, as they are conflicting objectives that every radio technology has to make tradeoffs with. All IoT applications need good coverage to connect the devices but some need to cover only certain indoor areas while others require extensive coverage in rural or remote regions. A technology with long range is better suited to connect devices scattered in a wide area. Traditional cellular technology, such as 3G or 4G, is a typical example of wide area solution with excellent coverage in most urban areas. LPWA technologies further improve the connectivity range by employing more robust coding schemes, which makes them ideal for reaching remote areas and penetrating deep indoors. Short range technologies, such as Wi-Fi and ZigBee, are suitable for connecting many devices deployed in close vicinity. The energy efficiency of a connectivity technology has a significant impact on the lifetime or the maintenance cycle of IoT devices relying on battery or energy harvesting and is dependent on range, topology and complexity of the connectivity technology. The overall energy consumption of the device also depends on the usage of the application, such as the frequency and duration of message transmission. Short range technologies like ZigBee rely on mesh topology to forward messages from one device to another over multiple hops. That way ZigBee can extend its coverage but may deplete batteries more quickly as an individual device must constantly listen and be ready to relay messages. Wide area technologies, such as 2G, rely instead on star topology and keep most of the intelligence and complexity at the base station where power supply is not a limiting factor. LPWA technologies, such as NB-IoT, further reduce the energy consumption by stripping down the signaling protocol and reducing the amount of overhead to the bare minimum, thus allowing longer battery life. Data rate requirements for IoT applications vary from hundreds of bit per second (bps) for metering to several megabits per second (Mbps) for video surveillance. Wi-Fi and cellular networks have used large bandwidth and complex waveforms with adaptive modulation rate to support high data rate. But they either consume more power or have a short range. In contrast, most LPWA technologies have much lower data rate and lower energy consumption as they employ more robust modulation scheme and run on commodity-priced micro-controllers with limited bandwidth. 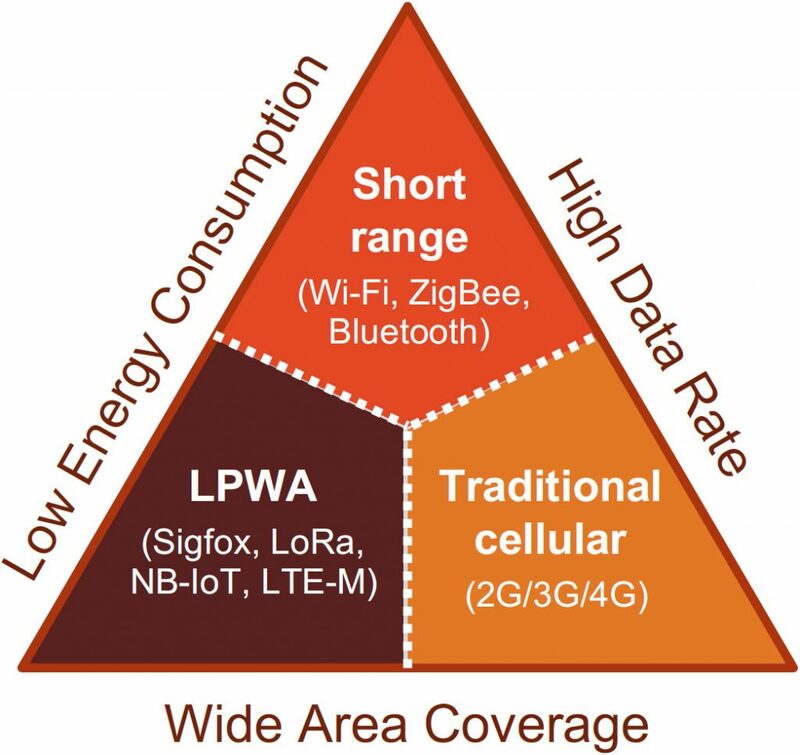 As illustrated in Figure 3, traditional cellular technology emphasizes on data rate and range with complex designs optimized for mass consumer voice and data service; short range technologies like Bluetooth Low Energy (BLE) and ZigBee focus on data rate and battery life at the expense of connection range; LPWA technologies, including NB-IoT, sacrifice data rate for superior battery life and coverage. In addition to the main technical considerations discussed above, there are other technical features that can be highly relevant for certain applications. Bidirectional communication – for some applications it is sufficient to have only unidirectional communication (uplink only) for the end device to report data to an access point or a gateway. A bidirectional link, however, is necessary for the end device to receive data from the access point. This can improve the reliability of data transfers through handshaking and security through authentication exchanges. Most of the technologies discussed here support bidirectional communication but some such as Sigfox in our view have inadequate downlink bandwidth to support features like over-the-air-software updates. Mobility – in many IoT applications, a device will be installed at a fixed location and paired to a single access point for the entire lifetime, but other applications may require the device to be operational as it moves through the coverage of different access points. While most of the technologies support device relocation to different access points, the relocation process can be as seamless as in the cellular network or occur only at scheduled intervals. Localization – device location is often valuable information. But GPS tracking is not always feasible due to its limited indoor coverage and the extra cost and complexity. Therefore, native support for localization is a desirable feature. Most wide area technologies can use triangulation to determine the device location but the accuracy is rather limited for technologies with narrow channel bandwidth and situations where the device is static without direct signal path. Wi-Fi and Bluetooth are constantly improving their localization capability as the algorithm is getting more sophisticated. Download our report and continue reading! 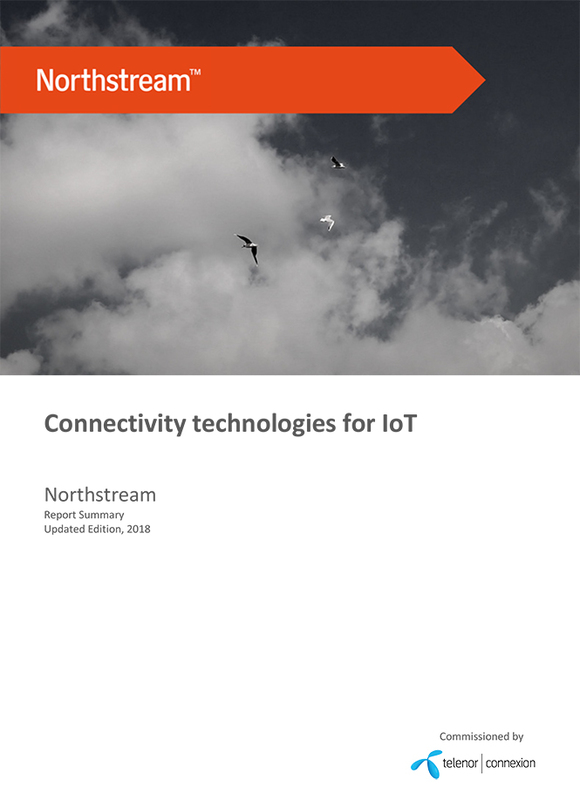 This text and the report is produced by Northstream and commissioned by Telenor Connexion.